Posted by admin on Mar 8th, 2016 and filed under Politics, Presidency. You can follow any responses to this entry through the RSS 2.0. You can skip to the end and leave a response. Pinging is currently not allowed. 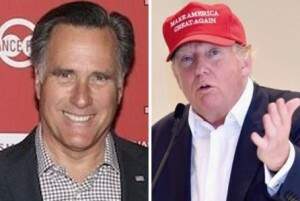 Although, despite his two resounding defeats in 2008 for the Republican Party’s nomination, and in 2012 against Barack Obama for the Presidency, no one accused Mitt Romney of not possessing an abundance of political intelligence.In fact, the vast majority of Americans have judged him as a decent individual. Yet, concealed behind his apparent decency, Romney has decided to succumb to his inner demons of foolish arrogance by attempting to exert control over the Republican nominating process from behind the scenes. His unusually harsh speech against Donald Trump, the Republican front runner, demonstrated the undeniable fact that he is completely clueless about the challenges, dangers and difficulties facing the United States of America both domestically as well as internationally. In reality, Romney, under the pretext of saving the Republican Party, has set about to spew fear and hatred, in order to stifle the will of the majority. Had Romney been endowed with the rare gift of statesmanship, he could have demonstrated his political wisdom by understanding the realities of the current situation, which, in turn, would have indicated a certain depth of vision. But it was and still is his intellectual shallowness, combined with his other weaknesses and his character, that made him in the past a loser. Lacking discipline and prone to overreaction under turbulent conditions, having little confidence in his political acumen and confused about his worldview, handicapped by his irrelevance and tormented by his many defeats, Romney is controlled by his fears and the absence of courage. Regrettably, Mitt Romney is not alone within the Republican Party. Many Republican office holders understand nothing and consequently have become both victims and executioners of their disastrous clinging to power. They have failed to grasp the depth of the ubiquitous resentment of Republicans and Democrats alike about the ruin of the national wealth caused by the reckless spending, the worldwide depression, and the lack of leadership that have contributed to the impoverishment of the greatest democracy on earth and the all-encompassing chaos throughout the globe. Domestically, the entire society has been suffering. Everyone is discontented. As a result, the vast majority of the American people have risen from their decades-old political slumber to protest. For the first time since 1980, a unified cry could be heard from all over the fifty states, saying that they have had enough of the status quo, namely, the incompetence and the arrogance of all three branches of the government. The faithful majority, fabricated seven years ago by Barack Obama, has not been a true expression of the national will but the tool of a small minority of Socialists, Marxists, and outright Communists. They are a self-satisfied and vain lot, convinced that history is on their side, and that their creation is perfection itself. The people have realized that they have been duped, the prestige of the Democrat Party has tanked and the government has lost all respect. This, combined with the inertia of the Republican Party, has ignited the spirit of revolt. The embodiment of this movement is Donald Trump. Neither Mitt Romney nor his like-minded co-ideologists realize that the more the politicians are opposed to this general movement against the status quo, the more difficult things can become. But when the country focuses more on restoring the United States of America to its greatness, the more likely it is that the country would successfully solve its mounting domestic and international challenges. Leadership based on reuniting American society is the best path to greatness in the 21st century.